Fundación Lukas is a non-profit organization that was founded in 2009 with the aim of improving the quality of life of the families and people with severe multiple disabilities. 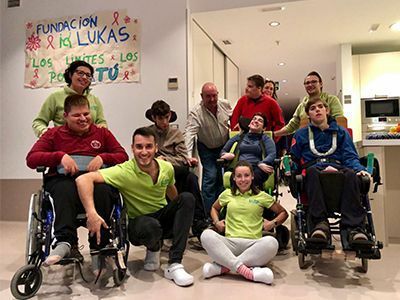 In 2014 we opened the doors of the FLK Center for young people with disabilities in Alicante, and in October 2016 the overnight stays began at the House-Home of the FLK Center. The Therapy Center offers an innovative and fully adapted resource that responds to the rehabilitation and therapy needs of people with functional diversity. It works at developing and enhancing the motor, cognitive and sensitive abilities of people with functional diversity. We include the family as an essential element to achieve maximum therapeutic benefit. In the three years of operation of the Therapy Center, we have carried out more than 2,000 therapies, including hydrotherapy, physiotherapy in the specially designed rooms and occupational therapy. Help the families and people with severe functional diversity. Be a reference organization and serve as an inspiration for a change in welfare and leisure models for people with severe functional diversity in Spain.